Should the Minister pay for the aide's sins? I agree with the IIM president's assertion here that a Minister should be held responsible if his officials are proven to be corrupt and that he had knowledge of their corruption. But before that can happen, the MACC has to prove that there's corruption in the first place. After that, the MACC has to prove that the political aide is corrupt with the knowledge of his boss the Minister. Yes, they should take ownership when their officials involved in irregular activities or enormous income or beyond norm spending. But if they don't know (but in certain case almost impossible the minister doesn't realise their official did something beyond their means) it not fair for them to held responsible. 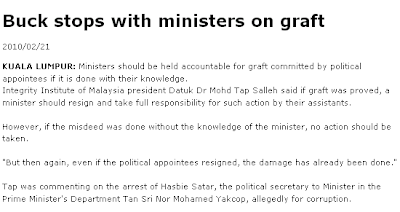 What about the Minister them self corrupted? To many example .... open book stories and no need to repeat again and again. rajraman666.So far all the BIG FISH minister cased closed and i closed my cased. We are racial but don't be RACIST. The Minister should be more forthcoming with why his aide resigned!! But the, that's what you would expect from Mohd Nor yapkop who was sacked from Bank Negara for $6 billion forex trading losees which affected our reserves and GDP severely. Some say it was $ 12 billion and others $30 billion !!!! Only in M'sia can such a person be elevated to Head of EPU!! And again clearly he has demonstrated an utter lack of integrity! Ni macam ayam cakap kat gajah!hehe. Of course you will argue that due process like MACC etc should take place before the Minister takes the rap because the subject is BN/UMNO. Will you still argue the same when the subject are those linked to the Pakatan? Recall the PKR frogs in Perak? What was your stance then? Difficult to believe that the Ministers are not aware of their Machai; in fact they are all part of the scam. What being said should be the threshold or minimum SOP required, at least for our Ministers. But I would be more than happy if our ministers go one step beyond i.e. resign with immediate effect the moment reasonanble doubt and suspicious are harbour upon themselves or their officials (like when MACC caught their men red handed with bundles of inexplained cash piles). Well, how can they be good leaders if they can't properly pick and lead good people surrounding them? Their follies? for failure to pick the right men to serve them....simple, thus, they have a bad sense of judgement. I think Anselmo is Nor Mohd Yakcop. Mat Tap is also beating around the bush. Get to the point ok. In the case of Hasbi Sattar, it is now becoming common knowledge that the RM2.0 million in cash was found in an apartment in Teluk Air Tawar which belonged to the wife of Tan Sri Nor Mohd Yakop, Puan Sri Fuziah Begum. So in this case how can the Minister claim ignorance of his Pol Sec's corruption? The RM2.0 million was kept in the apartment that belongs to his wife. I hope for the sake of his own integrity that Mat Tap would be more forthright. Jangan segan segan. Lets see if the MACC will call upon Puan Sri Fuziah to explain how RM2.0 million was found in her apartment? In other countries, the Minister would have resigned by now. Only here despite being so obviously exposed as corrupt these shameless people still cling on to their posts. And what about the PM? Why doesnt he fire the Minister? What kind of message is the PM sending out? That he does not mind if the Ministers are corrupt? Even if they get caught with RM2.0 million cash in their wife's apartment? The statement sounds reasonable and logical. That is what public expected. However expectation and reality always diverge. What been seen so far hardly any cabinet ministers ever commented about corruption charges especially against their own backyard e.g. MACC against PolSec. If government wants to show seriousness to combat corruption, for god sake speak LOUDLY against it though it may be hard to say against your own colleagues/staff/friends. The elected MPs might get more votes in the next election due to their stand. It might even save a government. Please walk the talk. Had enough of slogan and campaign. 3. Private Secretary 1 & 2 then you have Timbalan . If you only want to cherry pick Nor Muhamad Yakcob 's secretary, may God bless you. To be honest , you must enlist all the secretaries Mahathir had and their fortunes. Also enlist all the contracts Mahathir gave to his sons from Tongkah Holdings to IBM. If you want to be a crusader against corruption you must start from Mahathir's era. Forget not Mahathir invited Nor Muhamad Yakcub and Abul Ali into cabinet and Bank Negara respectively. You know the fish rots from the head. the notion of accountibilities and responsibilities ; the minister and family should be investigated also. You said, "But before that can happen, the MACC has to prove that there's corruption in the first place." Correction bro - it should be " But before that can happen, the MACC has to BE ALLOWED to prove that there's corruption in the first place." Simply because this body is still not 'independent' enough to take action and needs to wait for the right signals from the political bosses in power. Otherwise why the heck is there such delays in many cases from Samy Vellu's MAIKA Holdings matters, AIMST University matters to PKFZ situation and Khir Toyo's mansion issue? Investigate first the officials and the Minister concerned, if enough evidence AG must charge them after that prosecute in court but until then we should not speculate..all are innocent until found guilty under the law applies to both Government and Opposition. how about the minister involved during the time of the 2 missing jet engines? This minister knows he is on the way out. So he and Mohan Swamy are planning a RM1 billion medical facility near UKM. This the minister's planned -- self golden handshake.